Budd Boetticher directed more than 40 features in a career that is still largely known only by the most dedicated film scholars and Western buffs. Poorly represented on VHS at the height of that format, his films are all but MIA on DVD. 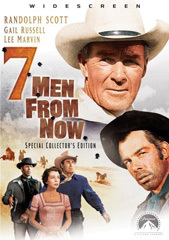 Seven Men From Now (1956) is only the second of his films to be released on DVD. The first was Behind Locked Doors (1948), a more-than-minor B-thriller famous largely for the appearance of cult figure Tor Johnson, the Swedish wrestler known for his Ed Wood Jr. roles. Thus, the long-awaited home video debut of Seven Men From Now, one of Boetticher’s greatest films and one all but impossible to see in any form for decades, is a major event. That the disc is beautifully mastered with a wealth of worthy supplements is a bonus. The virtues of the Ranown cycle are established in Seven Men From Now in an already mature and rich form. Randolph Scott enters the film in a suitably enigmatic manner, giving his back to the camera as he strides into a wet, stormy but still savage-looking desert scene and steps into a cave where two other men have taken refuge. He’s Ben Stride, a former sheriff tracking the men who killed his wife in a hold-up, even as he becomes the unwitting guide to an ill-equipped homesteading couple (Gail Russell and Walter Reed) and an uneasy trail companion to a pair of gunslingers (a charmingly dangerous Lee Marvin and his sidekick Red Barry) on the trail of the robbery payday. It’s a simple but potent situation with a skeleton cast of characters (they cross paths with a cavalry unit and pass through a town, where they briefly interact with other characters) and the Kennedy’s script is at its best when tossing these characters together in isolated moments, especially in one scene where the cramped quarters of the wagon during a rainy night offers Marvin’s garrulous gunslinger Masters an opportunity to shake up the sexual tension, making a show of it in front of the husband he calls “gentle” with a condescending air. In the parlance of Boetticher and Kennedy, this is an early draft at what they call the “talk trek” film which was honed in The Tall T (1957), Comanche Station (1960) and Ride Lonesome (1959). Stride and his outlaw nemeses/uneasy travelling partners verbally spar in preliminary collisions, as if feeling out the resolve of one another (Andrew Sarris described them “partly as floating poker games” for the way they bluff, challenge, call and back down from so many potentially violent clashes). (1) It’s a script where every word counts, whether it’s the garrulous nonsense of the husband, the stinging suggestions in all of the lines that Masters delivers with a cocky smile, or the terse, almost mono-syllabic observations and answers of Stride (who more often than not answers one question with another, like a challenge). Budd Boetticher had directed more than 25 features when he took on Seven Men, including his autobiographical Bullfighter and the Lady and a run of 9 films (including his first Westerns) at Universal, but he makes himself over with this film. He pares himself down to the rugged essentials and wrenches up the tension between the central characters, isolated in the empty desert, with remarkable economy. He makes Kennedy’s dialogue sing like lyrics and turns Scott’s “limitations” as an actor into a defining element of character: inexpressive and inflexible, his flat gravel voice masking his feelings and his lanky body perfectly at ease setting a horse or handling a gun, but less sure in moments of emotional intimacy. And he turns the expressive landscape of Lone Pine into a defining element of the film, a harsh and unforgiving but pure world outside society where Stride is almost sadly at home. The rather conventional afterward, with Stride back in a town setting and preparing to return to his former life with humility, doesn’t really feel all that convincing. Kennedy’s subsequent scripts make no pretence of a social redemption and, in the final Ranown films, Scott becomes (to borrow from another film) a veritable prisoner of the desert. “Seven Men From Now is a great film, a neglected masterpiece, indispensable for an understanding of Boetticher in demonstrating his style at its purest”, argues James Kitses in the disc’s scholarly commentary, which he delivers with the measured elocution of a lecture and the rich concentration of a monograph. The illustrations, of course, are provided by the film. Kitses was an early American champion of Boetticher (he organized the famous retrospective at the Edinburgh Film Festival in 1969 and wrote the first published study of the director in Horizons West (2)) and his commentary offers both close readings of key scenes and an overview of Boetticher’s career in general and the films of the Ranown cycle in particular. Among his most interesting and unexpected contributions are enlightening comparisons to Boetticher’s contemporaries, especially John Ford and Anthony Mann, and discussions of Boetticher’s influence on directors from Sergio Leone and Clint Eastwood to Paul Schrader (another early champion of Boetticher). The documentary, Budd Boetticher: An American Original (no listed director), an original 50-minute production made for the DVD, should not be confused with the feature-length Budd Boetticher: A Man Can Do That, directed by Bruce Ricker and produced by Clint Eastwood (the latter was broadcast on Turner Classic Movies on 21 December 2005, in conjunction with the broadcast début of the Seven Men restoration and the DVD release). Narrated and written by Fred Bailey, An American Original provides a fine overview of the life and career of Boetticher through film clips, interviews with Peter Bogdanovich, Taylor Hackford, Gretchen Wayne, Clint Eastwood and Quentin Tarantino (all of which are culled from Ricker’s interview sessions for A Man Can Do That), and archival interview footage with Budd Boetticher (much of it from Arnold Kunert’s Budd Boetticher: One on One) and Burt Kennedy. It is a respectable documentary and a capable introduction, better than most such made-for-DVD productions and, until Ricker’s richer and more-nuanced production is released on home video, the most authoritative available to viewers. The single-disc Special Collector’s Edition also includes the original theatrical trailer (presented full screen, it looks remarkably good, considering it didn’t get the same restoration treatment as the film) and the brief featurettes, Lone Pine and The John Wayne Stock Company: Gail Russell. The former is a general introduction to Lone Pine, California, the shooting location of many a Hollywood Western, including Seven Men and Boetticher’s subsequent “talk trek” films, the latter a profile of the actress in stills, film clips and narration, and a perhaps too tasteful discussion of the alcoholism that killed her at the age of 36. Andrew Sarris, The American Cinema: Directors and Directions 1929-1968 (Chicago: University of Chicago Press, 1968), p. 124. Jm Kitses, Horizons West (London: Thames and Hudson, 1969). Sean Axmaker is a film critic for the Seattle Post-Intelligencer and a DVD columnist for the Internet Movie Database, and is a frequent contributor to MSN Entertainment, Asian Cult Cinema, Greencine.com, and StaticMultimedia.com. His reviews and essays are featured in the recently released Scarecrow Movie Guide.